Even though Cranbrook experienced a few snow flurries today, the campus daffodils are also in bloom. 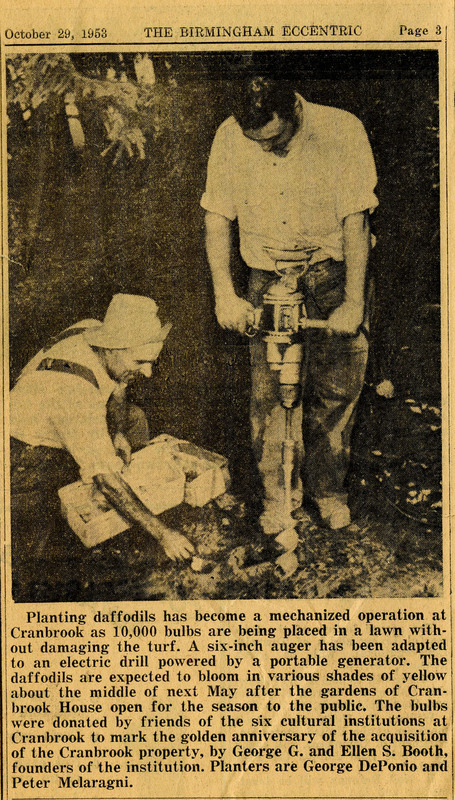 It reminds me of what was known as “Daffodil Hill.” In 1953, in anticipation of Cranbrook’s Golden Jubilee celebration (the 50th anniversary of the year the Booths purchased the original 175 acres), Henry Scripps Booth led an effort to raise funds to plant daffodils at Cranbrook House. 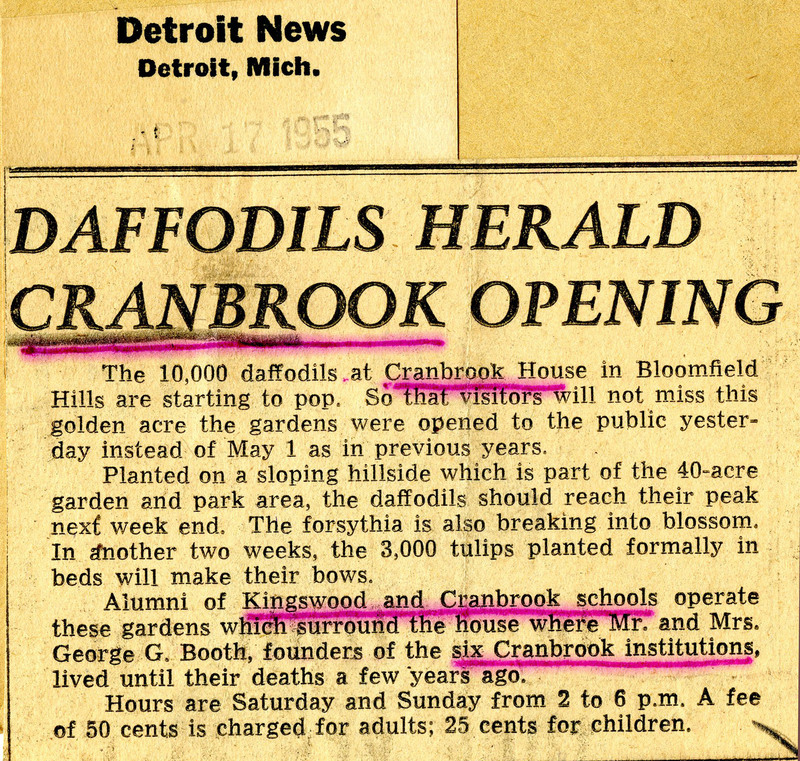 The Cranbrook Foundation Daffodil Fund was established and enough money was raised to plant 10,000 daffodils in the fall. 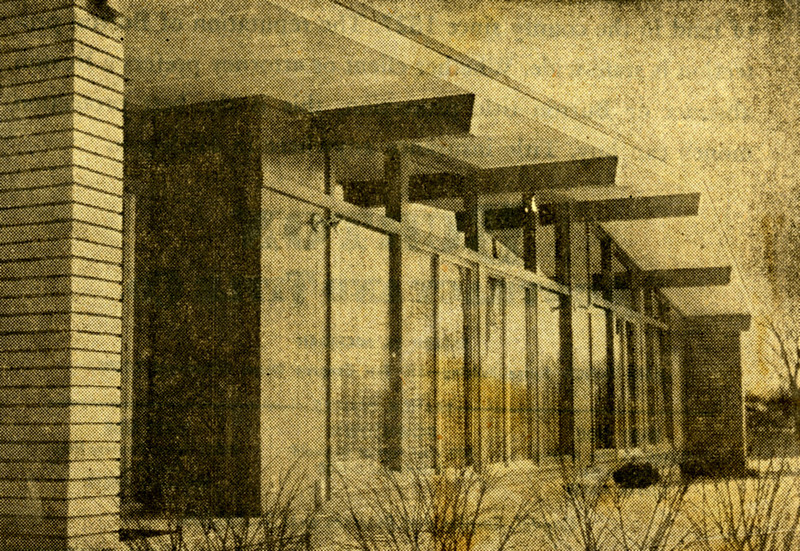 By 1955, visitors were flocking to the campus just to see them. News clipping, The Birmingham Eccentric, 1953. Cranbrook Archives. News clipping, The Detroit News, 1955. Cranbrook Archives. 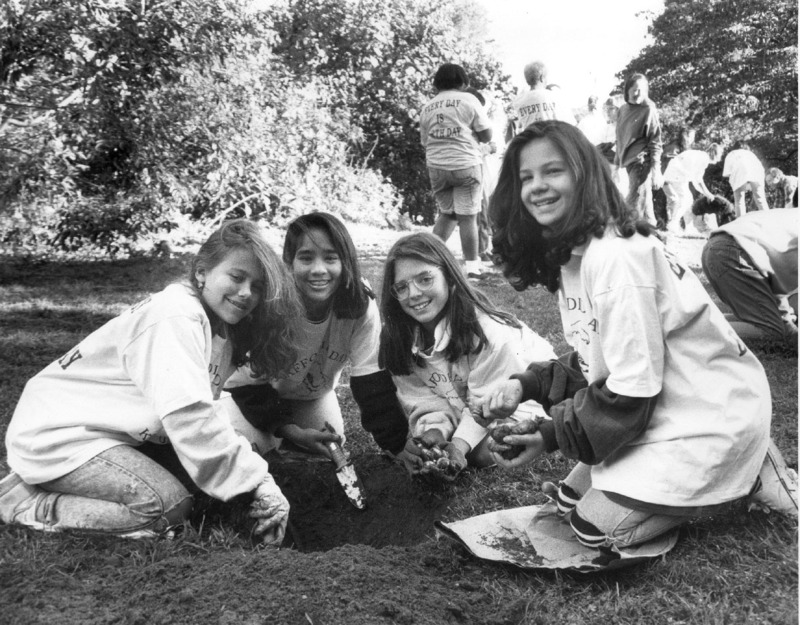 Middle School girls planting daffodils for Earth Day, 1990. Cranbrook Archives. 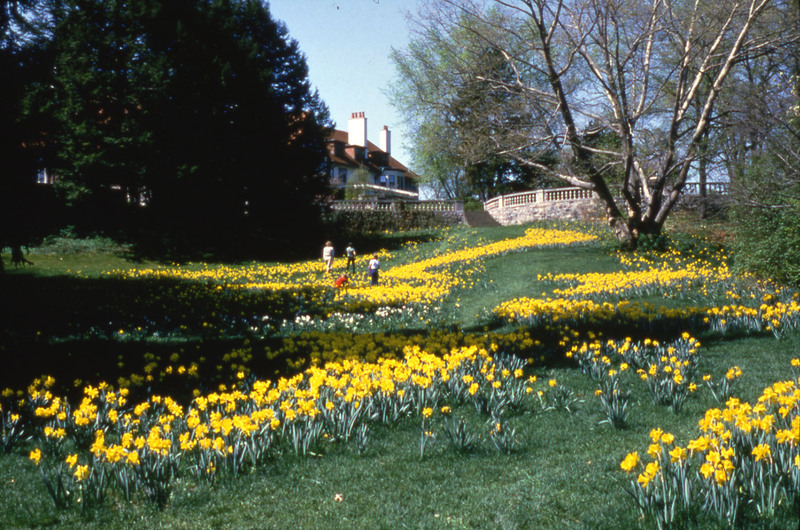 Originally known as “Golden Glade,” the area soon became known as Daffodil Hill, Spring 1985. 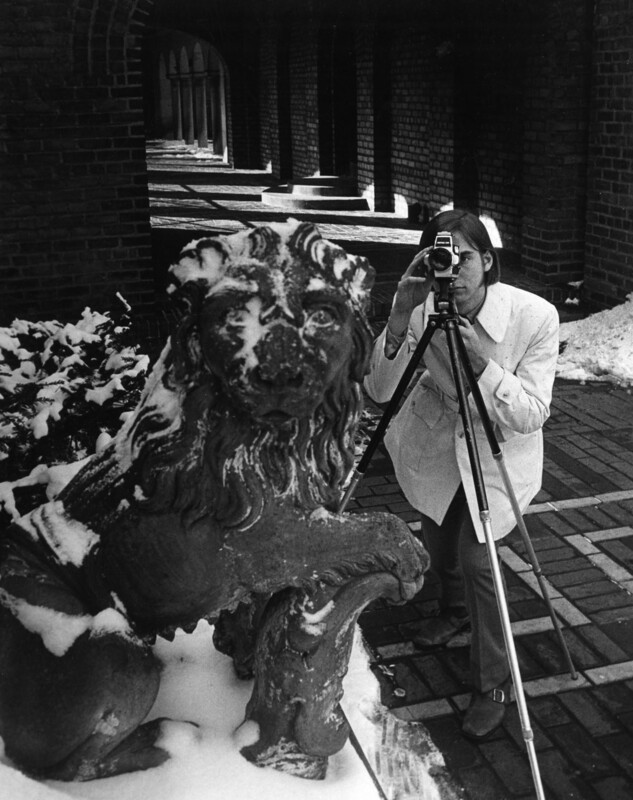 Ralph Mize, photographer. Cranbrook Archives. Every Sunday night I look forward to watching “Who Do You Think You Are?” A show that combines historical research, genealogy, and archives all in one? Perfect for a research geek like me. This past Sunday, actor Tony Goldwyn was the featured celebrity seeking to uncover his roots. I never realized that his paternal grandfather is THE Samuel Goldwyn! And even more surprisingly is that his maternal grandfather is Sidney Coe Howard. I bolted upright in my chair when I heard that name as, of course, Howard has a Cranbrook connection! 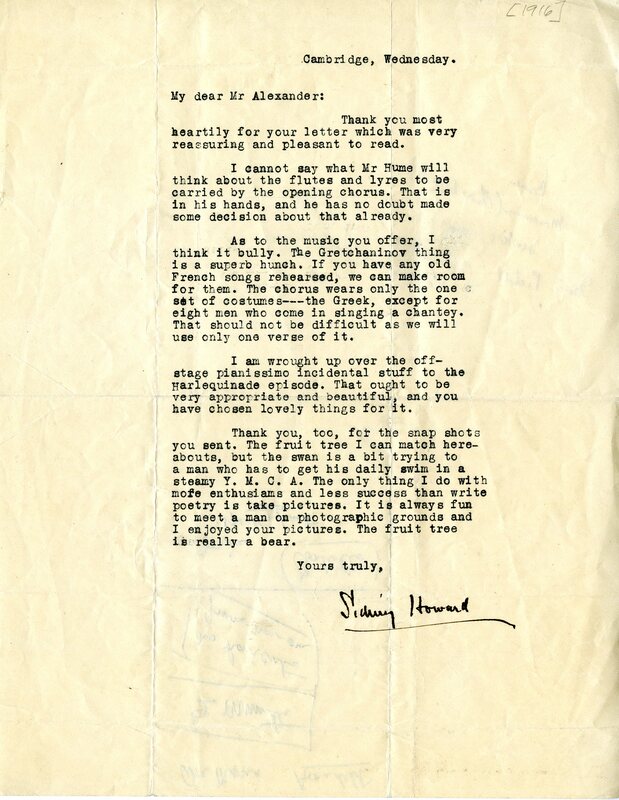 Howard (1891-1939) was the American playwright and screenwriter best known as the posthumous winner of the 1939 Academy of Award for adaptation of the screen play for Gone with the Wind. However, 23 years earlier, Howard penned the script for the Detroit Society of Arts and Crafts (DSAC) production, The Cranbrook Masque. Commissioned by George Booth at the suggestion of director Sam Hume, Howard wrote the Masque as the dedication program for Booth’s new Greek Theatre at Cranbrook. Howard and Hume sought to utilize every part of the theatre in order to demonstrate its possibilities. Costumes were designed and made at Cranbrook by the costume department of the DSAC, led by Katherine McEwen, and were fitted to the actors onsite. 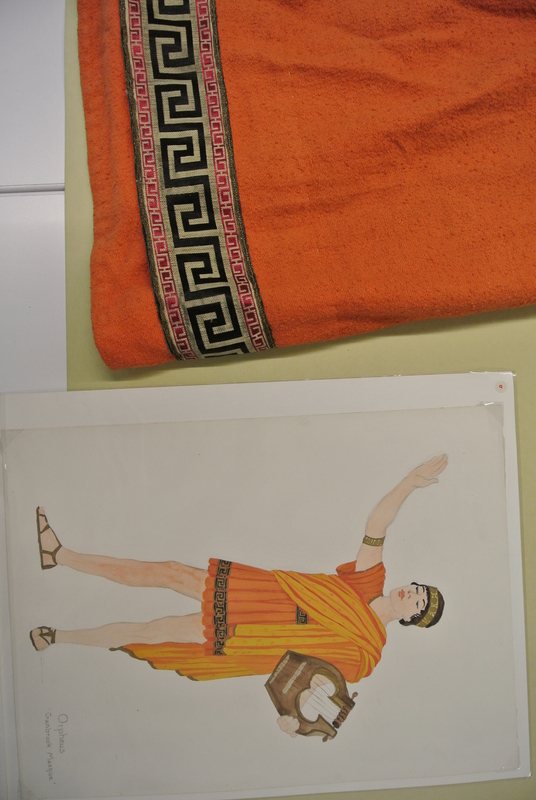 The Costume for Orpheus is part of Cranbrook’s Cultural Properties collection. The Cranbrook Masque tells the story of the conflict between romance and materialism, and was expressed through five episodes showing the development of drama throughout the ages – ancient Greece, medieval Europe, Elizabethan England, and 17th century Italy. Through research and travel in Europe, Howard was able to gather material to ensure the historical accuracy of both the scenes and the dialogue. A contemporary news critic wrote “the use of archaic words and the introduction of long-forgotten customs are said by experts to be flawless.” Howard also made use of the natural outdoor setting of the Greek Theatre for special effects. In the first episode, timed at sunset, Pan made his appearance silhouetted against the backdrop of the setting sun. As the light faded, a sophisticated artificial lighting system, designed by Hume, was gradually introduced. Correspondence to Frederick Alexander, music director of the Cranbrook Masque. Cranbrook Archives. The performance ran for two consecutive nights in June 1916, and the theatre was filled to capacity with more than 500 guests. 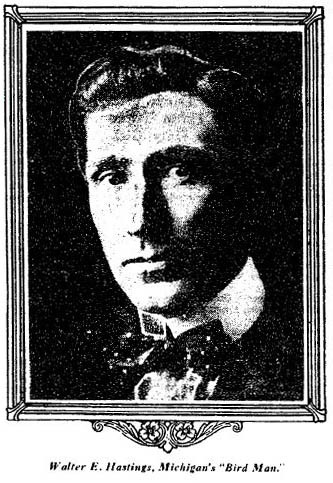 The Cranbrook Masque was the first public production of Sidney Coe Howard’s, yet he did not attend the performance. Though the Booths invited Howard to visit Cranbrook, he sailed for France in early June to serve as an ambulance driver for the duration of WWI. 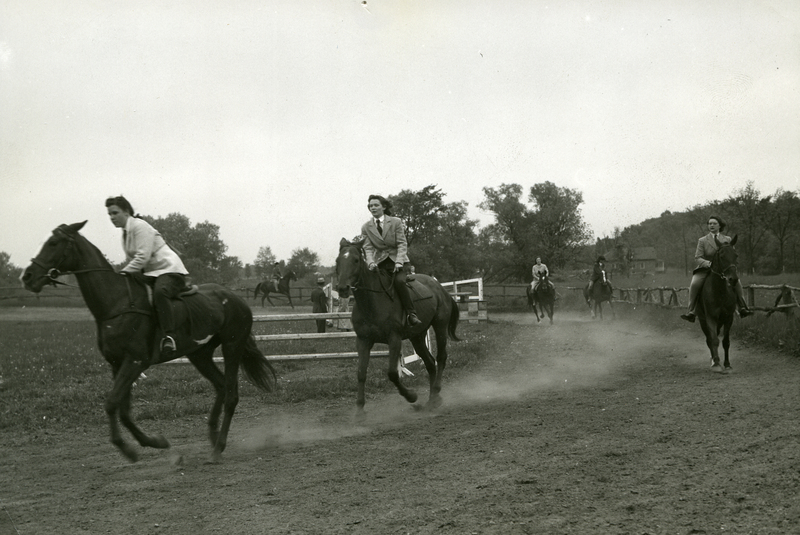 Shortly after the opening of Kingswood School for Girls in the fall of 1931, headmistress Katherine Adams reported that horseback riding would be a part of the physical education program, due in large part to the cooperation of nearby Bloomfield Open Hunt Club. Several of the girls already boarded horses in nearby stables, including the Hunt Club. The Kingswood Riding Club was officially established in 1939 and the school catalog outlined that girls would ride on the Hunt Club’s bridle paths in spring and fall, and in the covered ring during winter months. Girls rode on Wednesday afternoons as part of “club day” but the sport quickly became so popular that they also rode on Sunday mornings. In the spring of 1940, Cranbrook School boys joined the girls for the Sunday morning rides, during which they enjoyed breakfast at the Club House. Kingswood Riding Club, 11 Oct 1939. Cranbrook Archives. By the fall of 1940, the club had grown to 26 members and met on Mondays and Wednesdays. Katherine Unger, of Walled Lake, was hired to “teach the riding club the fine points of riding and horsemanship”, and in the spring of 1941, the Kingswood Riding Club held its first horse show. Riding took place at nearby Bloomfield Hunt Club and at the Outland Riding Stables (located on 14 Mile Road) where there was an inside ring. The following spring, the Kingswood Riding Club held its first horse show. In September 1941, Unger expressed hope that 1-2 indoor shows would be held during the winter, and that more girls would own horses. “The school horses are all right for beginners but as was so apparent at the show the girls who had their own mounts made the best showing.” Headmistress Margaret Augur felt the school could not encourage horse ownership (due to the added expense for the girls) and worried that competitions would become a “rich girl’s sport” and thus, a bad tendency for the school. The 2nd annual Kingswood Horse Show, 20 May 1942. Cranbrook Archives. The second annual Kingswood Horse Show was held on May 20, 1942 at Outland Riding Stable with judged competitions and an awards presentation. Virginia McCullough won first place in all of the classes she entered – Hunters Class, 3 Foot Jump, Horsemanship for Owners, Open Jumping 3’6” and Hunter Hacks. Phyllis Klinger took first in the Three-gaited Class and Anita Bray for Horsemanship for Non-Owners. 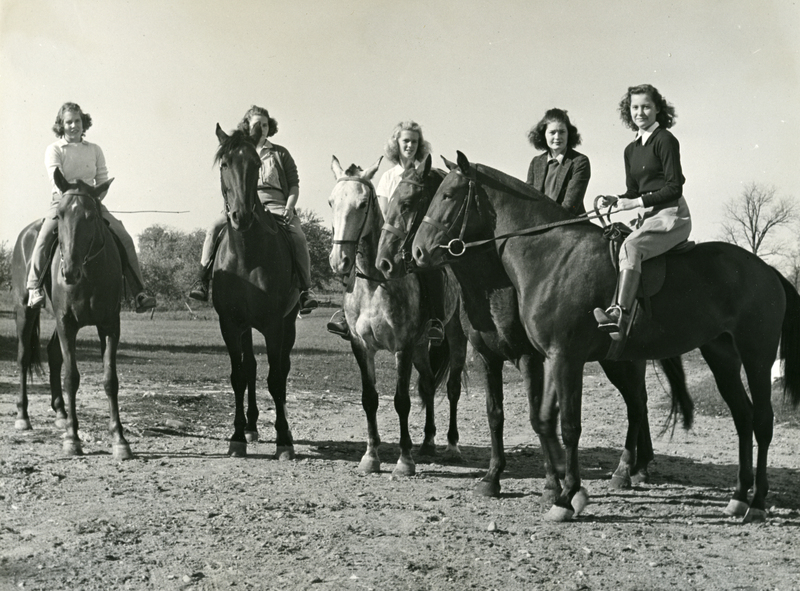 During the fall of 1942, the girls planned a spring horse show but by December, gas rationing due to World War II meant that the girls were unable to secure taxis to the stables. By March 1943, taxi service was discontinued and even though riding continued to appear as a sport in the school catalog until 1947, the club was never reinstated. Although there is no documentation that Amelia Earhart ever visited Cranbrook, records of one of her visits to Michigan are housed in the Cranbrook Archives. The photographs and telegram illustrated here are from the Gliders, Inc. Records and help tell not only the story of Amelia Earhart, but also that of glider aviation in Oakland County, Michigan. 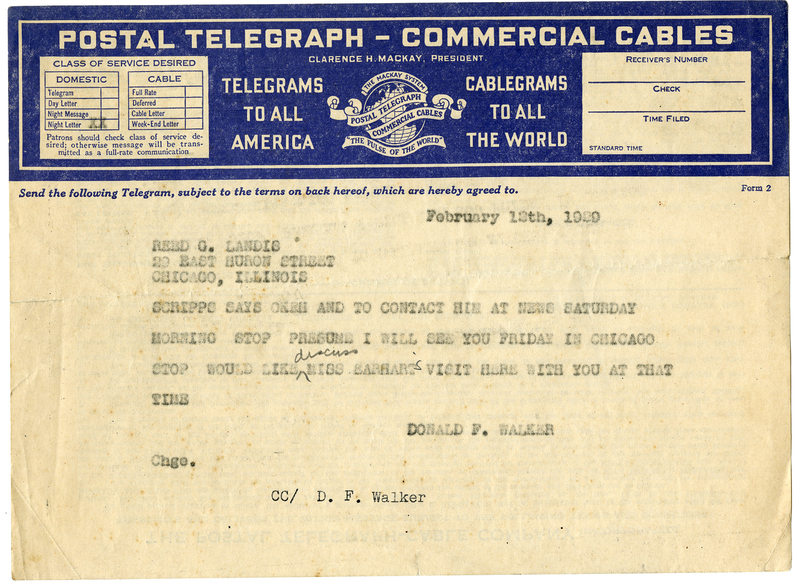 Telegram, 12 Feb 1929. Gliders, Inc. Records, Cranbrook Archives. 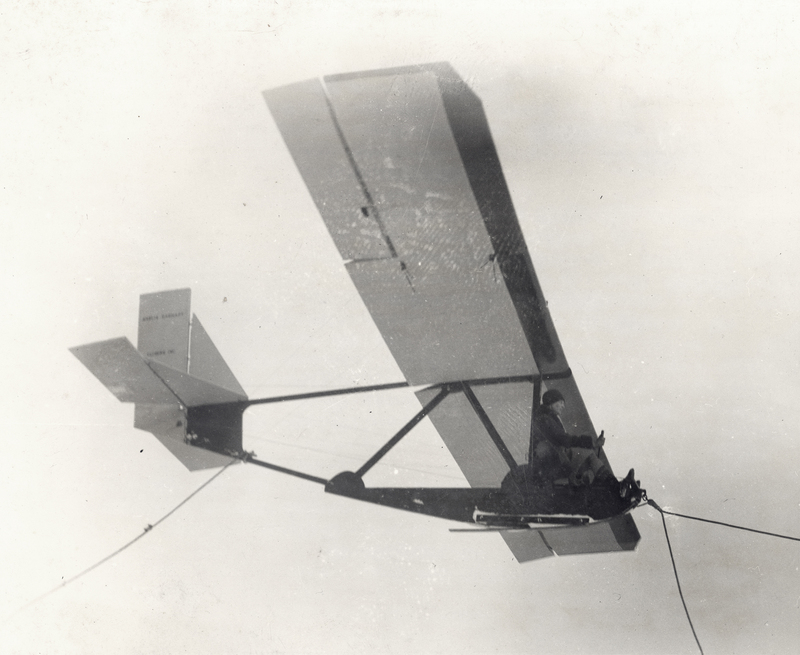 The first glider plane was designed in 1852, but it was not until September 1928 that Gliders, Inc. became the first company in the United States that exclusively manufactured motorless aircraft. Gliders, Inc. was founded by William E. Scripps, the younger brother of Cranbrook’s Ellen Scripps Booth. 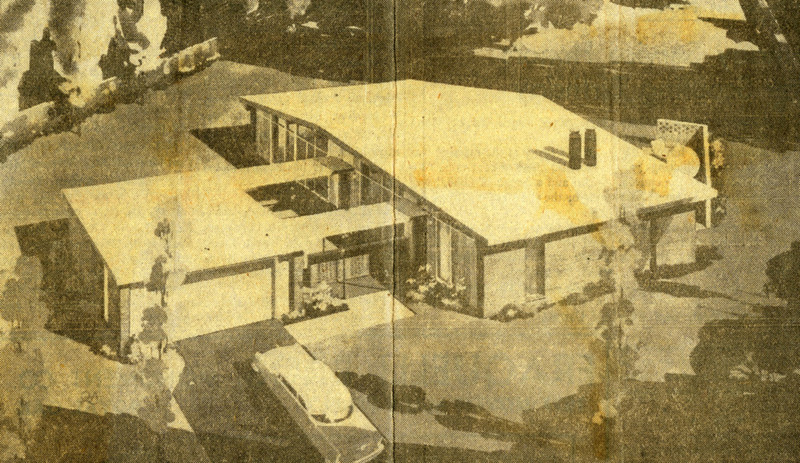 The factory, located in Lake Orion, Michigan, produced first and second class gliders, and the “Detroit Gull” became the glider of choice for many gliding clubs across the country. Gliders, Inc. was also called upon to do much of the early glider pilot training – over 800 men and women in 1929. Major Reed Landis, Amelia Earhart, Nina Downing Scripps, William Scripps, Don Walker, and Frank Blunk at Willow Run, Feb 1929. Photo by Detroit News. Cranbrook Archives. In December 1928, Scripps invited Amelia Earhart to his estate, then known as Wildwoods. Earhart accepted and in February 1929, took her first glider ride at the “Scripps Field” in a Gliders, Inc. Primary Training Glider. Amelia Earhart flying the primary training glider, Feb 1929. Photo by Detroit News. Cranbrook Archives. In November of 1929, Earhart and 25 other women gathered at Curtiss Airport in New York to establish The Ninety-Nines, Inc. – an aviation organization for any woman who held a pilot’s license. Earhart was the first president. Maxine Dunlap of San Francisco was the first woman to earn a glider license in 1929. Hers was a third-class glider license. Anne Lindbergh followed in 1930 with a flight that earned her third-class, second-class, and first-class licenses. She was the first woman in the US to earn a first-class glider license. 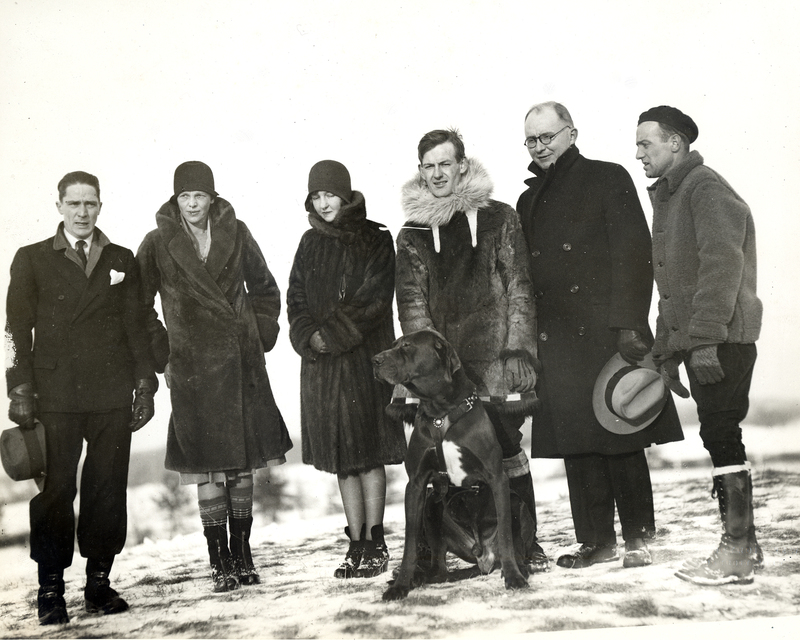 Check back next week for a post about Lindbergh’s connection to Cranbrook, and yes, she DID visit here! In honor of Women’s History Month, we like to try to tell the stories of women that might otherwise go unnoticed. Thousands of women have stepped foot on the Cranbrook campus, or have been involved with Cranbrook in some way. One such woman was Amelia Elizabeth White (1878 – 1972), philanthropist, passionate champion for the rights of the Pueblo, and a collector and promoter of Native American Art. In 1937, she donated a very large collection of Native American art and artifacts to Cranbrook Institute of Science, where they remain today. From the 1938 Cranbrook Institute of Science Annual Report. Born into an upper class family in New York City, White was educated at Bryn Mawr and traveled widely before she and her sister Martha served as volunteer nurses with the Red Cross in World War I. After the war, White, who had first traveled to New Mexico in 1913 to visit a friend, arrived in Santa Fe where she purchased a tract of land just south of the city. She soon built a home called “El Delirio” or “The Madness” (designed by William Penhallow Henderson) which quickly became a popular gathering place for writers, artists and intellectuals. 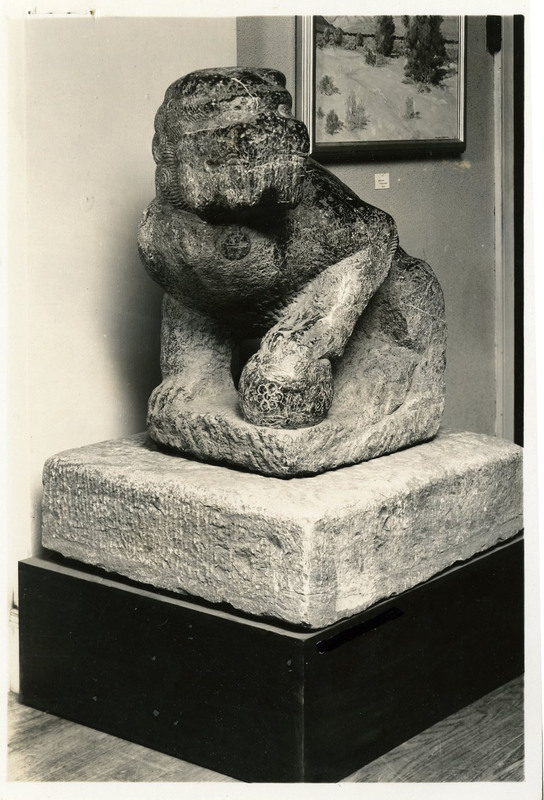 By 1923, White had opened an art gallery called “Ishauu” in Manhattan ( run by Dolly Sloan), in order to promote southwestern Native American Art. White was a member of the Eastern Association on Indian Affairs (EAIA) initially composed of men and women residing in and around the city of New York who shared an interest in the life and crafts of the Pueblo. She was instrumental in the organization of The Exposition of Indian Tribal Arts in 1931 and served as chairman of the Executive Committee. Along with other patron-philanthropists including Mary Cabot Wheelwright and Abby Rockefeller, White’s goal was to show Native American art as a traditional art form. The exposition included more than 600 pieces of pottery, jewelry, textiles, sculpture, paintings, beadwork, and basketry, many of which were from White’s personal collection. 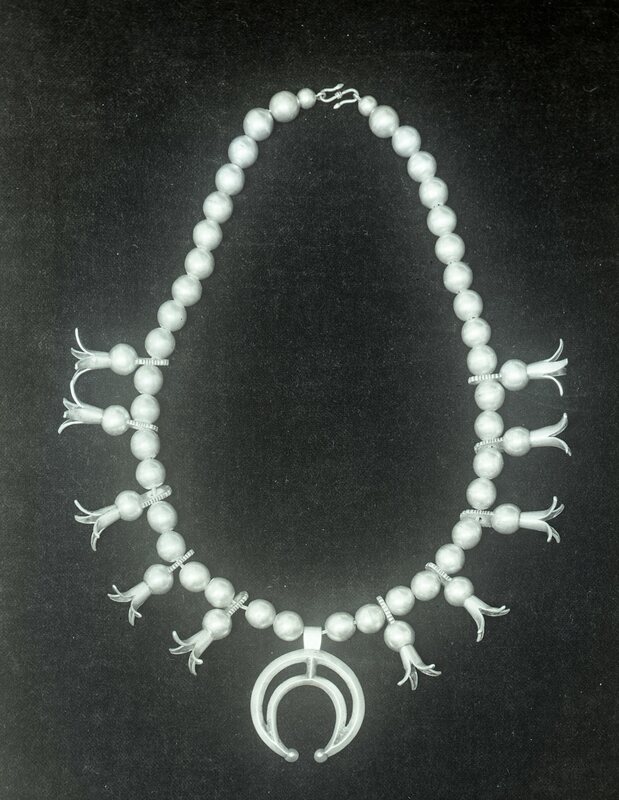 Navajo necklace. Image courtesy Cranbrook Archives. To continue her wish to “have the American Indian take his place in the museums for American art in this country,” White dispersed her collection of art and artifacts to numerous museums across the country including Cranbrook Institute of Science, Cleveland Museum of Art, the National Anthropological Archives at the Smithsonian, the New Mexico History Museum, and the Detroit Institute of Arts. 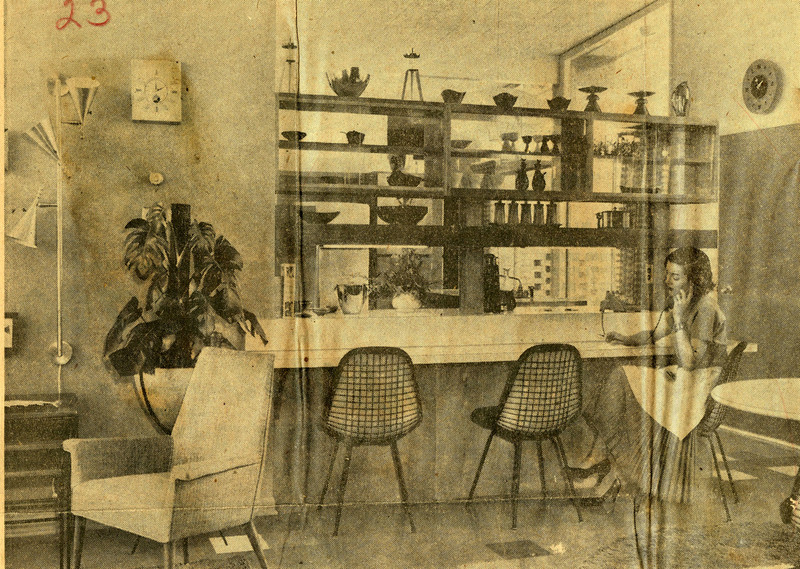 White’s collection, which she donated in 1937, was the largest single accession of the Institute other than our founders, George and Ellen Booth. The donation included textiles, pottery, jewelry and artifacts from the Pueblo, Navajo, Kiowa and Alaskan Inuit. 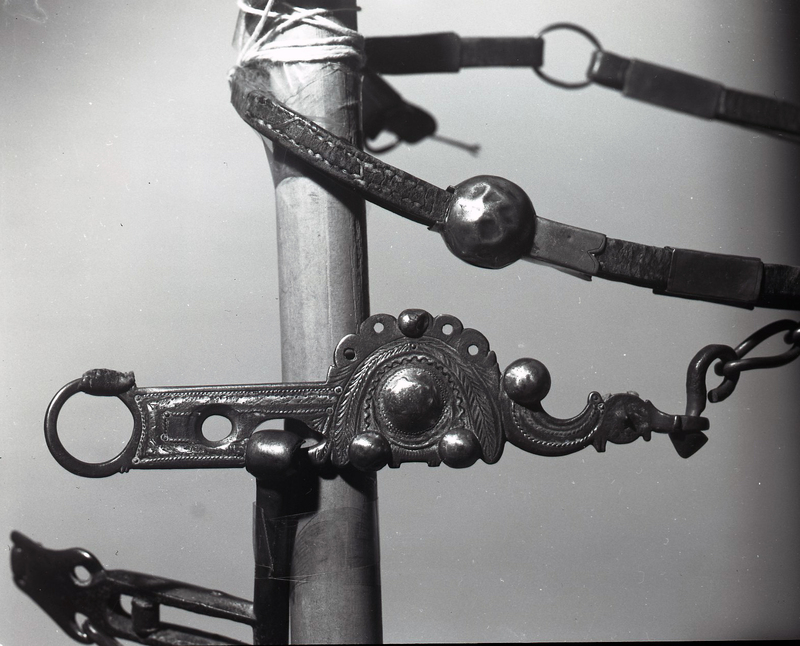 Navajo wedding belt. Image courtesy Cranbrook Archives. The other night I saw the most interesting show on PBS called “Fake or Forgery.” An investigative journalist and two noted art sleuths joined forces with cutting edge scientists to discover the truth behind a painting the owner thought to be a Degas. They thoroughly searched the provenance of the painting, and used scientific methods like X-ray fluorescence (XRF) to determine if the pigments used in the painting were compatible with Degas’ known palette. It made me think of the many works of art across the Cranbrook campus that could benefit from in-depth scientific research like this. And, it prompted me to relay the story of a discovery the archives staff made several years ago. The painting we fondly refer to as “The Bogdani” was originally purchased by George Booth for Kingswood School for Girls, where it hung in the Domestic Science Dining Room. Purportedly painted by noted Hungarian Jakob Bogdani (1658-1724), the still life was found in a storage room badly in need of cleaning and restoration. 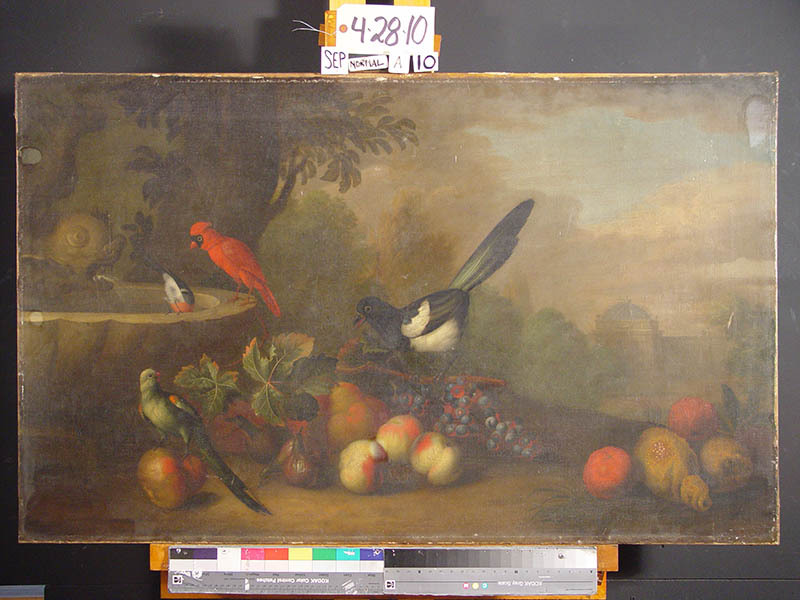 The painting was conserved by Ken Katz of Conservation & Museum Services in Detroit. During the several months of conservation, we were able to visit the studio in order to see the work in process, and the results were amazing. As I looked closely at the work, my heart almost stopped beating. Bogdani’s signature was gone, and in its place was another name! My first thought was how hard I had lobbied to get the painting conserved and now it was a forgery! However, after doing additional research, I discovered that the artist, Tobias Stranover (1684-1731) was actually Bogdani’s son-in-law and former student. Phew! 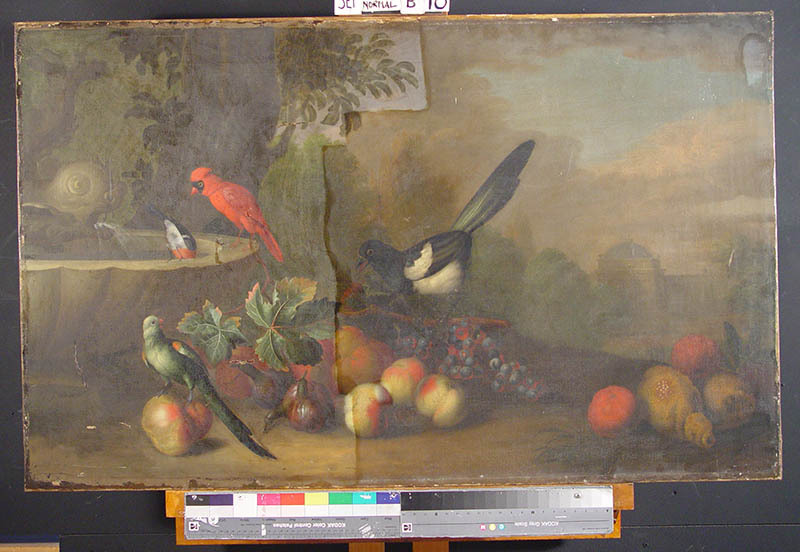 Although this meant the still life was painted around 1810 instead of 1790, at least we still had an original painted by an artist who, with his father-in-law, provided the finest exotic bird and animal paintings in England. The painting currently hangs in the reading room of Cranbrook Archives. 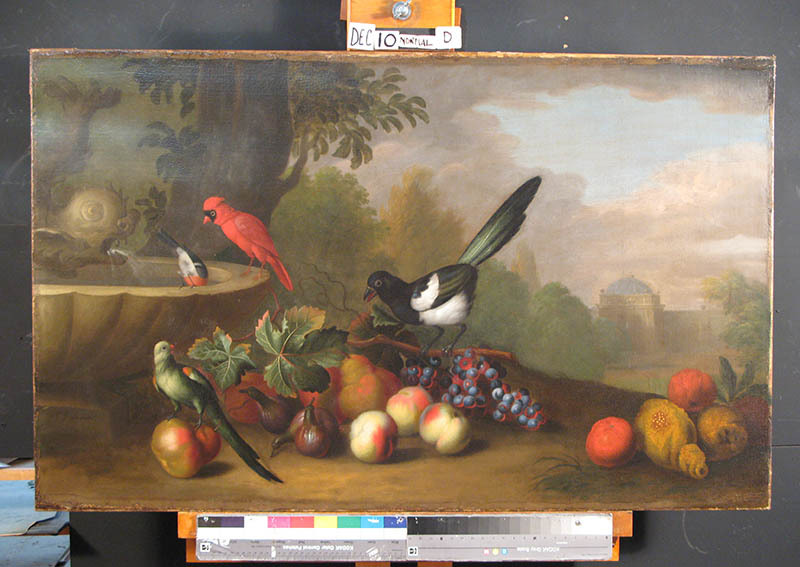 After conservation, details in the painting can be seen can be seen more clearly, and the brilliance of the colors pop. Often times in collections we discover materials that are unexpected, rare, or just plain fabulous. The following images are all of the above. 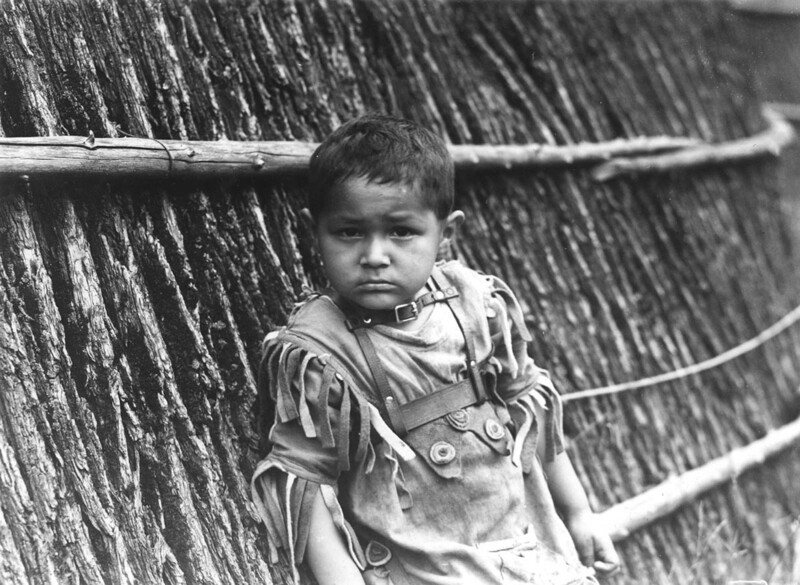 Several years ago, when processing a set of negatives from the Institute of Science, I was pleasantly surprised to discover a set of photographic images of Native Americans, primarily Odawa/Ottawa from Leelanau County in northern Michigan. They were taken by Walter E. Hastings (1887-1965) between 1928-1933. Hastings was a naturalist, photographer, and lecturer, and was Michigan’s first conservation film-maker. Hastings’s interest in nature began as a child when his mother put together a collection of stones, shells, and Native American artifacts for him with the hope that he might become a naturalist. Clearly, it worked! His interest in photography began in 1918 when he received an inexpensive camera for Christmas from his boy scout troop. From 1921-1932, Hastings worked for the University of Michigan Museum as the “Custodian of Birds’ Eggs.” In that capacity, he served as a collections manager, enlarging and arranging the collection, and took numerous photographs which documented the nesting habits of Michigan birds. Employed as the photographer for the Michigan Department of Conservation from 1926-1951, Hastings was a pioneer of wildlife and conservation photography. Johnny Willow Bird, age 3 yrs. Taken at St. Ignace, Michigan, Oct 1933. Courtesy Cranbrook Archives. Native American Campsite, Horton’s Bay, Michigan, Jul 1933. Courtesy Cranbrook Archives. 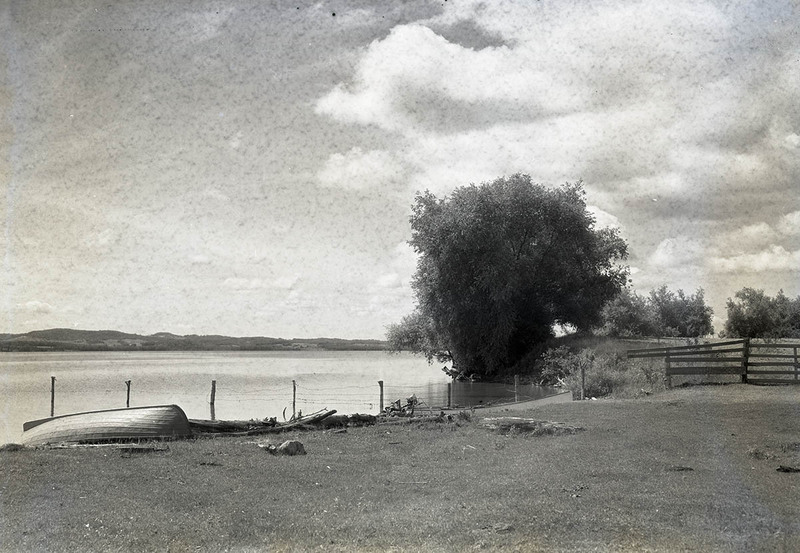 The Institute of Science has several Odawa/Ottawa and Chippewa objects, collected and donated by Hastings, from the same geographical region where the photographs were taken. It is likely that the photographs were donated to the Institute of Science along with the artifacts. The Institute of Science photograph collection was later transferred to Cranbrook Archives. The Walter E. Hastings collection is located at the Archives of Michigan (MS 88-27).